Millicent Fawcett – Our family home, where I live with my wife and our two daughters, is in Suffolk. Given this and the fact that in 2018 our country will celebrate the centenary of the Women’s Vote, I have chosen Millicent Fawcett, GBE. Millicent was born in Aldeburgh, Suffolk in 1847. She was a feminist and suffragist acting as a tireless campaigner for women to have the vote. It is widely considered that her leadership was instrumental in gaining the vote for six million British women (over 30 years old) in 1918. A memorial inscription ironically added to the monument of her husband, Henry Fawcett in Westminster Abbey states that “she won citizenship for women”. The experience of leading PwC’s Building Public Trust programme has taught me the significance of Technology and the Digital Revolution. It is both a challenge and an opportunity for current and next generation leaders. Today’s technology enables people access to data and the opportunity to judge. It also provides a global distribution network through which that judgement may be shared at exceptional speeds. 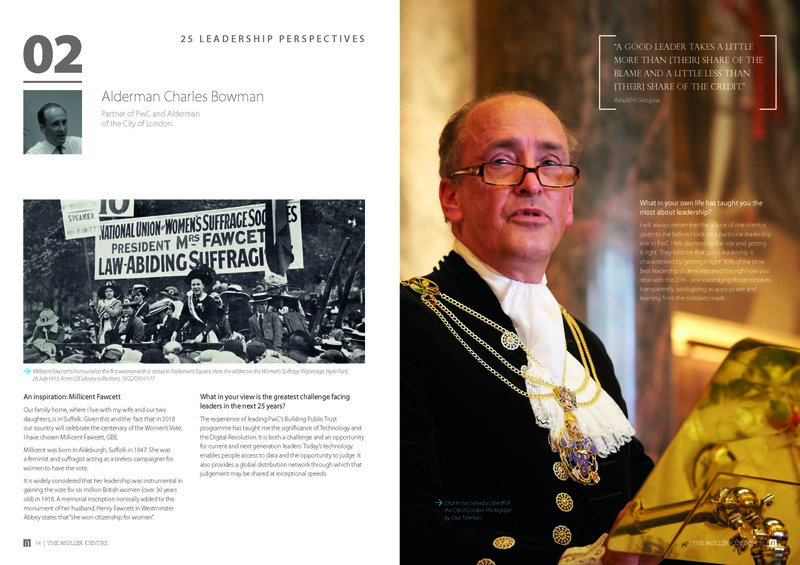 Alderman Charles Bowman the møller centre | 15 What in your own life has taught you the most about leadership? I will always remember the advice of one mentor, given to me before I took on a particular leadership role in PwC. I felt daunted by the role and getting it right. They told me that good leadership is characterised by ‘getting it right’ 80% of the time. Best leadership is demonstrated through how you deal with the 20% – acknowledging those mistakes transparently, apologising as appropriate and learning from the mistakes made. “A good leader takes a little more than [their] share of the blame and a little less than [their] share of the credit.” Arnold H Glasgow Partner of PwC and Alderman of the City of London. Charles has served as Sheriff of the City of London. Photograph by Clive Toteman. Millicent Fawcett is honoured as the first woman with a statue in Parliament Square. Trying to lead change is always extremely difficult; there is inevitably a level of resistance. I was the first full-time Vice-Chancellor of the University recruited from scratch and a significant number of members of the Regent House, the resident Cambridge academics, had voted against the idea of a permanent VC, understandably unwilling to invest what they perceived as so much power in one role. In the end though, we managed to suggest changes that increased the role of our world leading academics in the administration of the University and therefore its international competitiveness and these changes were accepted by the Regent House. There was also an encouraging growth in the University’s interactions with industry and a huge increase in the national importance of the Cambridge cluster of successful small companies. The key to successful leadership, here as anywhere, is to explain your vision, have it agreed, then find the right people to implement it. It is also critical to acknowledge that progress never comes without risk – and that no decision is worth the delay required to eliminate it. You never will. Act, then deal with what occurs.